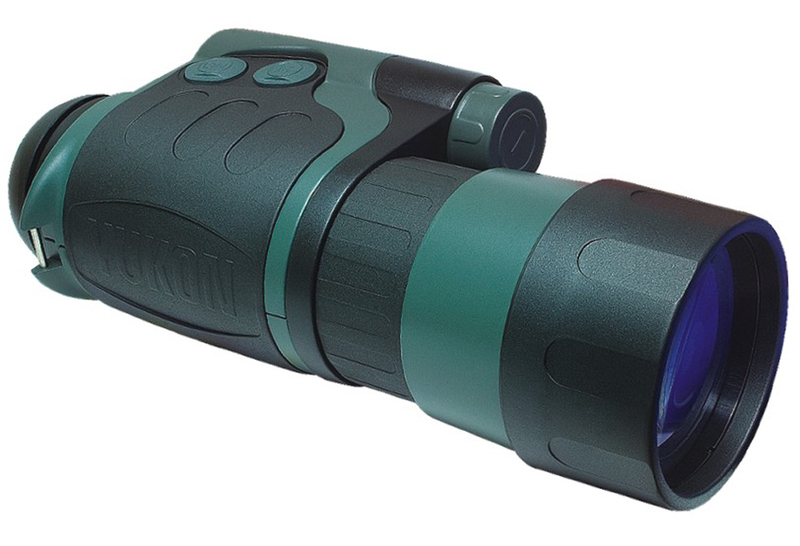 The NVMT 4x50™ night vision monocular is an incredible multi-functional unit; both compact and lightweight, this versatile monocular weighs only 13oz. Featuring a durable, Rubber Armor body the 4x50 is weather resistant and completely capable of being taken off the beaten path. The built-in Pulse™ IR system uses a powerful infrared illuminator to provide added light detection under conditions where there is little or no detectable light and the illuminator’s pulsating beam reaches 2 to 3 times farther than other infrared systems and reduces battery drain. The NVMT series is the epitome of what a multi-tasking line should be; completely accessory driven, this monocular has the ability to be converted into a riflescope, mounted to head gear or transformed into a night vision camera. Available accessories include a IR flashlight, digital camera adapter, NVMT head gear kit and NVMT riflescope conversion kit. The NVMT 4x50 is backed by Yukon’s Limited Lifetime Warranty.